May 31, 2016 — Memorial Day is a time for barbecuing, drinking beer and lounging about with friends and family on one of those ever so rare work-free Mondays. Or is it? The holiday, which now essentially represents the unofficial start of the summer party season, actually has a darker, grimmer purpose. It is a time meant to reflect on war in all of its destructive, voracious ferocity and remember the people who lost their lives in combat. Rather than grappling with the various moralistic or rational justifications for any given war and their validity (or lack thereof), I choose to use Memorial Day as a time to reflect and stew upon man’s proclivity towards violence and war and the deaths that result from it, whether those lost lives belong to commissioned soldiers or civilians unwillingly folded into the warfare. While it is impossible for someone like me, separated from war by both physical space — and more abstractly, circumstance — to truly grasp the horrific reality of war, there does exist certain unique pieces of art created by first hand participants that offer a glimpse into the realities of warfare and its destructive results. Less, subtlety, it's a time to remember that war is killing and dying. These pieces make it difficult for civilians to gloss over or forget, as we are wont to do, the many lives that perished in service of warfare. These are a few selections that are notably potent, though there are many more. In Flanders fields the poppies blow Between the crosses, row on row That mark our place; and in the sky The larks, still bravely singing, fly Scarce heard amid the guns below. We are the Dead. Short days ago We lived, felt dawn, saw sunset glow, Loved and were loved, and now we lie In Flanders fields. Take up our quarrel with the foe: To you from failing hands we throw The torch; be yours to hold it high. If ye break faith with us who die We shall not sleep, though poppies grow In Flanders fields. John McCrae was a Canadian doctor who fought on the Western Front in World I and later served in the medical corps in France, according to a short biography Emory University’s English Department. While he escaped battle during the latter part of his service, McCrae died in 1918 of pneumonia at the age of 45. As a participant in The Great War, McCrae offers a unique perspective on the plight of soldiers, both those who have died and the living they left behind. McCrae’s poem “In Flanders Field” captures the horrific nature of war by examining a battlefield through the eyes of recently-deceased soldiers. The poem offers a grim perspective that puts the reader face to face with the soldiers who lost their lives in battle. He also utilizes a naturalistic look at the indifference of nature towards man’s destruction to a chilling effect. One of Lichtenstein’s most famous works, Whaam! depicts an American fighter pilot shooting down an enemy aircraft in the artist’s famous comic book style. An image from DC Comics’ All American Men of War originally inspired the work, according to the Tate Modern Gallery, which possesses the paintings. This painting challenged audiences to confront the horrific nature of war from a new vantage point by presenting the ultimate destruction of war and the plight of pilots through a commercialized, pop genre of art. “Throughout the 1960s, Lichtenstein frequently drew on commercial art sources such as comic images or advertisements, attracted by the way highly emotional subject matter could be depicted using detached techniques. Transferring this to a painting context, Lichtenstein could present powerfully charged scenes in an impersonal manner, leaving the viewer to decipher meanings for themselves,” according to Tate Modern’s description of Whaam!. Also, by illustrating the frenetic absurdity of warfare, the painting also identifies with the existential uncertainty that soldiers in the Vietnam War faced everyday by depicting the way in which the difference between life and death could come down to which pilot could pull the trigger fastest. 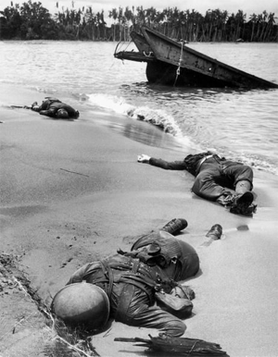 George Strock’s photograph of dead American soldiers lying on Buna Beach in Papua New Guinea during World War II appeared in Life magazine in 1943. It was the first image of dead American soldiers to be published during the war, and escaped censorship from the U.S. government thanks to an endorsement from President Franklin Roosevelt “because he was concerned that the public had become complacent about the war effort,” according to Watching War by Jan Mieszkowski. The image is one of the first unaltered depictions of the very real plight of many American soldiers during World War II (during which 400,000 American soldiers perished). There is little to be said about this photograph, taken from the air following the detonation of the Fat Man atomic bomb detonated over Nagasaki during World War II, that the photo does not say for itself. 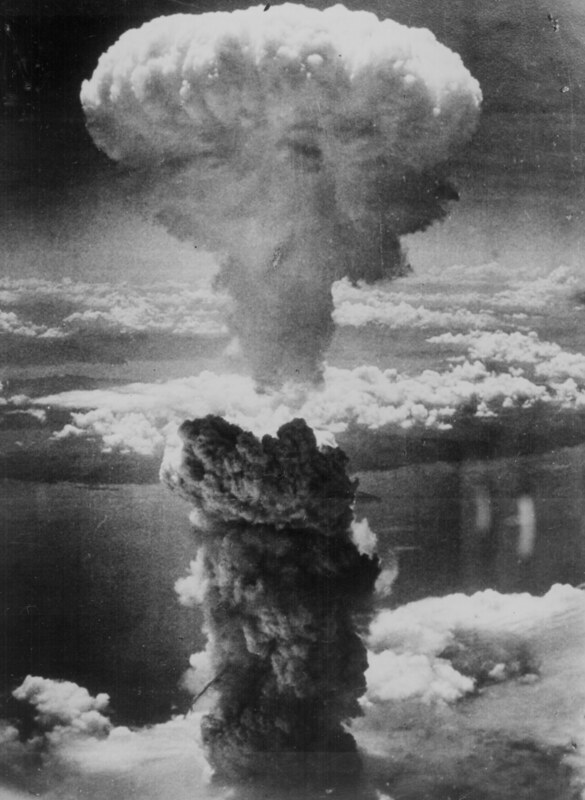 It illustrates the incomprehensible destructive power of the bomb and man’s equally incomprehensible ability to stomach that destruction. While many view Memorial Day as a holiday to remember soldiers lost during war, I feel it is important to reflect on the civilian casualties as well so that we always remember that war is not moralistic or discerning—an atom bomb, a bullet a grenade will kill a non-combatant just as quickly as a soldier and that loss of life is equally disturbing and relevant. Gary Knight is a decorated British photojournalist who spent time documenting the invasion of Iraq for Newsweek. This photo series partially chronicles a chaotic battle between U.S. marines and Iraqi forces near Baghdad. The series can be viewed on Knight’s website. One photo in the series is particularly powerful (though they all illustrate in grim detail the explosive, destructive realities of war in a way that is difficult for those not in battle to understand). The photo in question shows a group of marines standing in a demolished neighborhood following an artillery attack. Many look disoriented and one deceased soldier’s body can clearly be seen in the foreground. The photo is a stark portrait of the existential reality soldiers at war face every day. Nothing but hurt left here. Nothing but bullets and pain and the bled-out slumping and all the fucks and goddamns and Jesus Christs of the wounded. Nothing left here but the hurt. Believe it when you see it. Believe it when a twelve-year-old rolls a grenade into the room. Or when a sniper punches a hole deep into someone’s skull. Believe it when four men step from a taxicab in Mosul to shower the street in brass and fire. Open the hurt locker and see what there is of knives and teeth. Open the hurt locker and learn how rough men come hunting for souls. Army veteran Brian Turner is a decorated writer, poet and professor whose work focuses predominantly on the realities of modern war. He draws from firsthand experience as he is a veteran of the Iraq War and was also deployed in Bosnia and Herzegovina. Turner is one of those poets with the unique ability to not only elicit empathy from readers, but to bring them closer to a reality they have never experienced. His use of visceral imagery give his work a gut-wrenching authenticity that is difficult to conjure and even harder to read. “The Hurt Locker” offers a personal glimpse into the psyche of a soldier in a way no newscast could ever accomplish, and it is a sobering reality that readers are confronted with. Memorial Day has its roots in Decoration Day, a holiday created to remember Union soldiers who lost their lives fighting during The Civil War, and no photo better illustrates the plight of both Union and Confederate soldiers than Timothy O’Sullivan’s “A Harvest of Death”. The photo depicts the bodies of fallen soldiers strewn across the battlefield at Gettysburg and offers a startling contrast to many of the paintings that came of the war, which depict the heraldry and pomp of warfare. Gravesites in Fort Logan National Cemetery in Denver, Colo. Image by Tony Massey and used under the terms of a Creative Commons license.